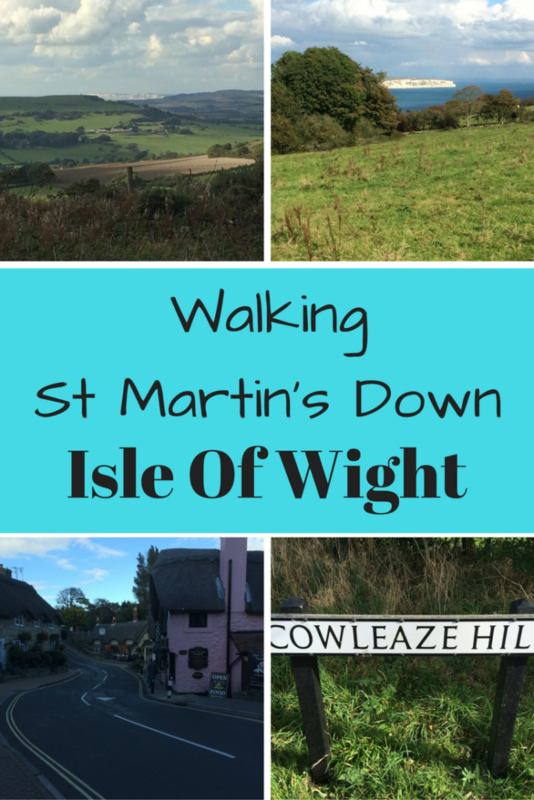 One of the great joys of living in the Isle of Wight are the wonderful walks that are right on my doorstep. 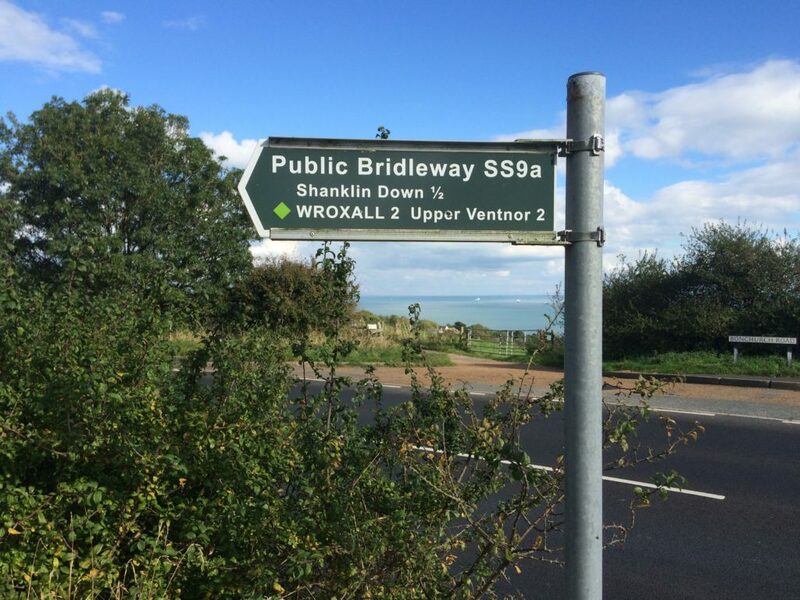 For a small Island we are well appointed with around 500 miles of managed public footpaths and bridleways. 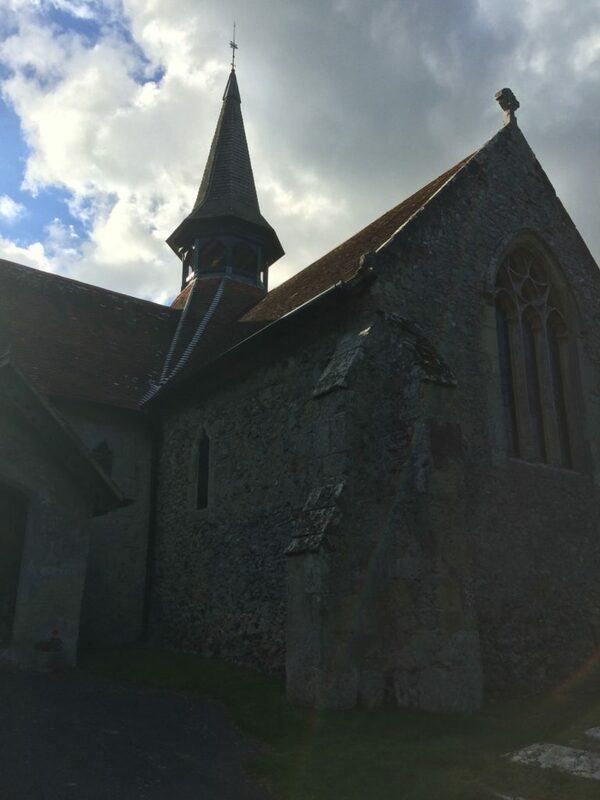 I often walk up to the top of St Martin’s Down, which towers over the nearby town of Shanklin. I normally walk there via the Wolsey Way. There is downside to going this way, a very steep section that I hate climbing up. This time I thought I would try a different route, and come back down the steep hill to see if it would be any easier. By the way I was very wrong!!! 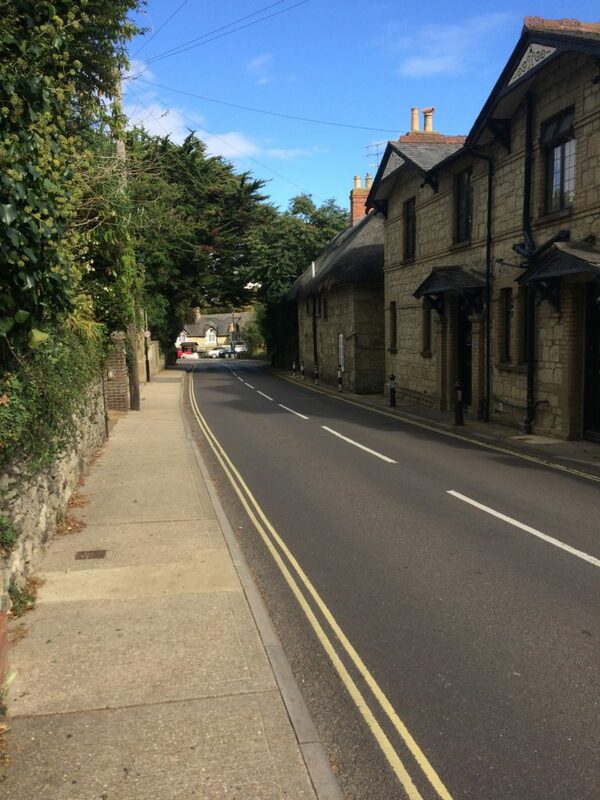 Starting off from the Old Village walk out towards Ventnor on the A3055 walk past St Blasius Church on your left and pass a row of houses. After the houses, both sides of the road become farmland. 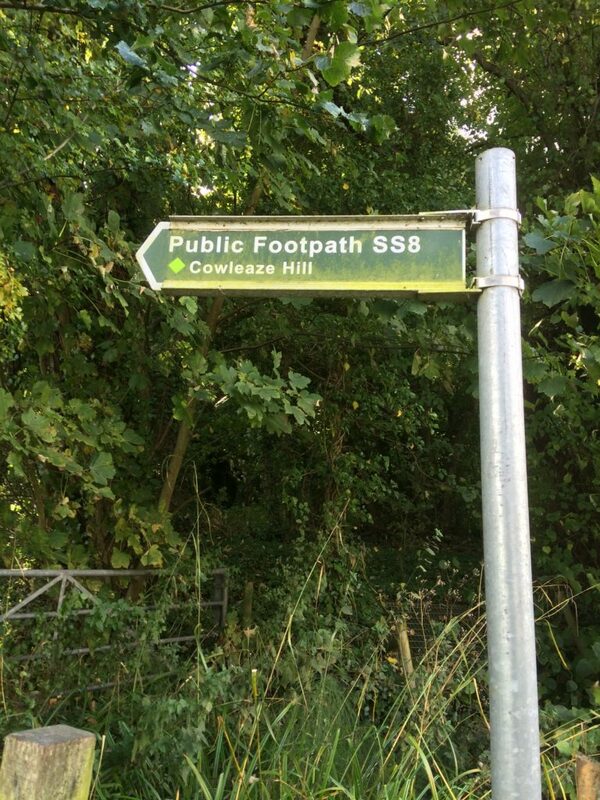 Look out for a public footpath sign to Cowleaze Hill, which is on the left. Go over the stile and walk up and across the field to another stile located on the hill on the other side of the field, this is hidden in trees. The field is quite steep but you are rewarded with lovely views. Cattle graze these fields but on this day they were all happily grazing in a far corner. Once on the pavement continue left up a hill until you see a public bridleway signpost, to Wroxall and Ventnor on the other side of the road. Follow this path and take the next left, which is a path flanked on both sides by tall trees that look like an overgrown hedge. 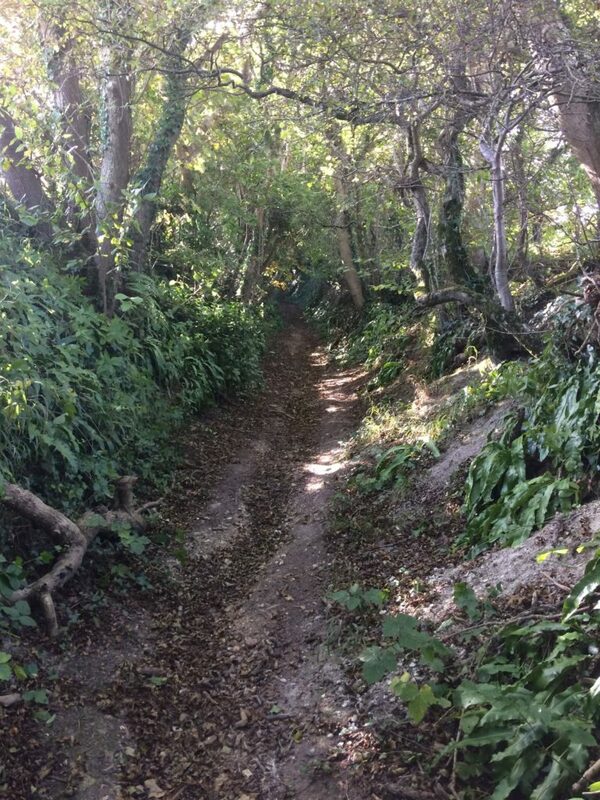 This is one of the pathways to St Martin’s Down. 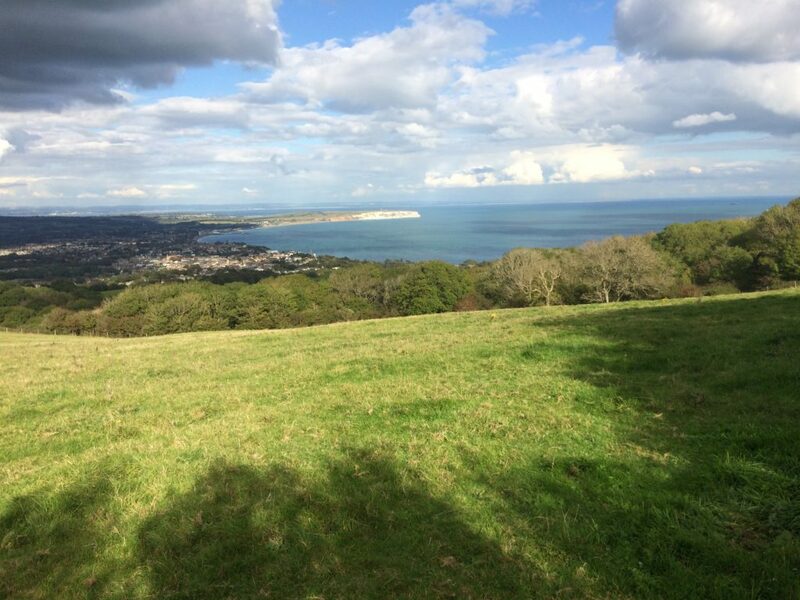 At the top of this path as you emerge from the trees and you can see beautiful views over to West Wight including Highdown Cliffs and stunning rolling farmland. 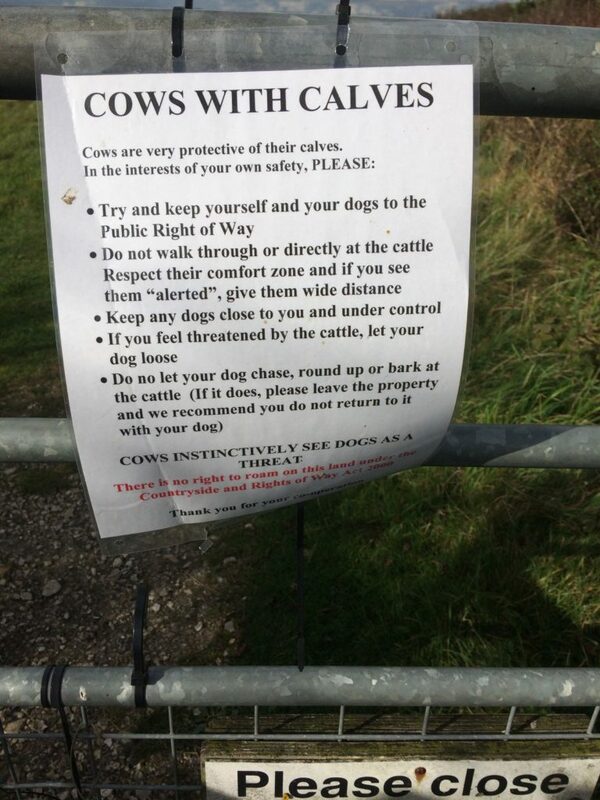 As I walked to the right towards the top of St Martin’s Down I saw this sign warning people about the dangers of walking near to cows with calves. 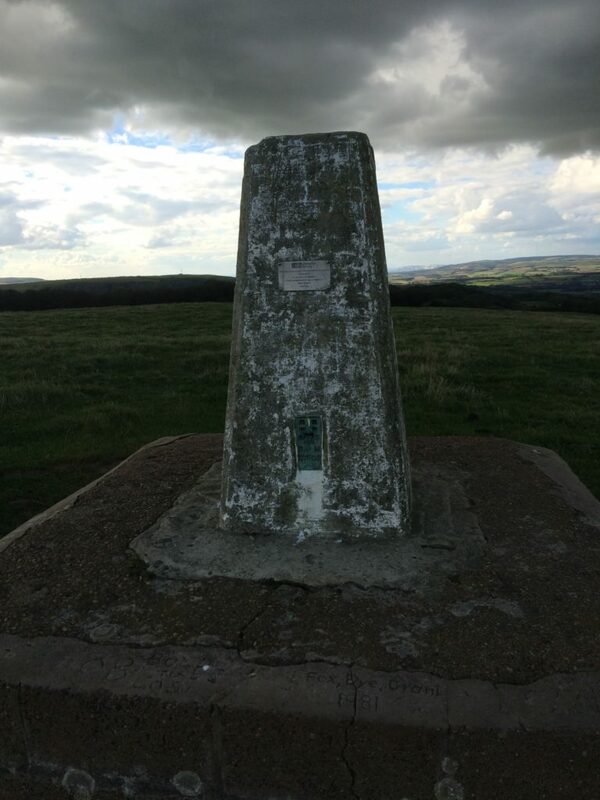 At the top is a Trig Pillar (trigonometrical point) that was installed there by the Ordnance Survey and was used until fairly recently to take measurements, ensuring all our maps were accurate. Now all the mapping in the UK is done by satellite, these pillars are obsolete, but they are so weighty and substantial they will be part of the landscape for many years to come. Apparently, they are like icebergs, what you see on top is only a small amount of the whole, underneath is underpinned by huge quantities of concrete. As you stand by the trig pillar you get a fantastic view of a good deal of the Isle of Wight. To the North I could see East and West Cowes and the Solent, together with huge areas of the English coast. Here is a picture of my favourite view. 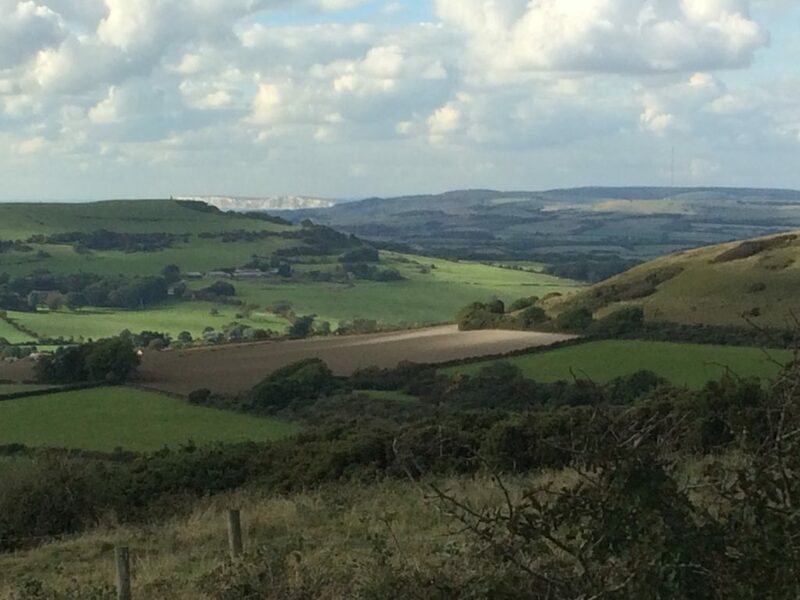 Taking in the Culver Cliffs, Culver Down and the English Channel from the top of St Martin’s Down. (Note to self take binoculars next time!). If you turn around so the trig pillar is behind you the path down is slightly to your left heading towards the corner of the field. Once you are at the corner follow the line of the hedge and turn right though some wooden gates. The next bit is a really steep path. This is where I realised my error. Coming down a very steep hill like that is quite scary and really hard on your legs and knees. I need to avoid doing this, unless I have walking sticks, as next day my leg muscles were complaining rather loudly. I’m sure it can’t be good for your knees or ankles. 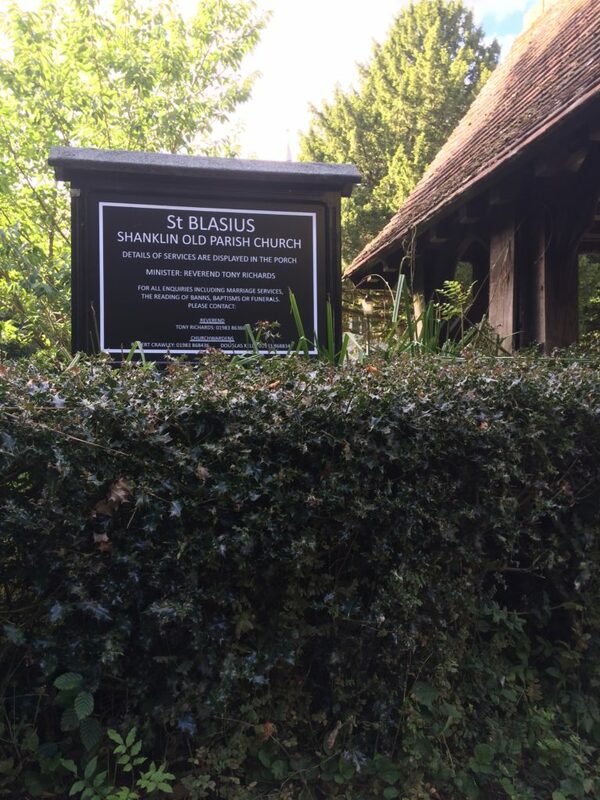 The path then takes you to the back of St Blasius Church, you hop over a stone stile and walk through the church yard. 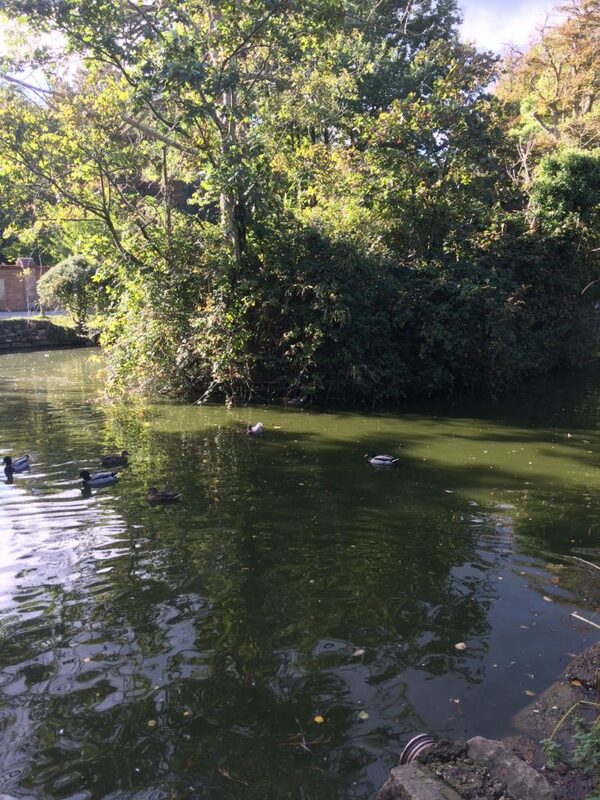 Exiting the Church you walk past a duck pond that is next to a large recreational park. I like to stop for a while and watch all the ducks, moorhens and seagulls. At this stage I changed my footwear from my hiking boots to a pair of sandals, so I would feel more comfortable going into a restaurant. 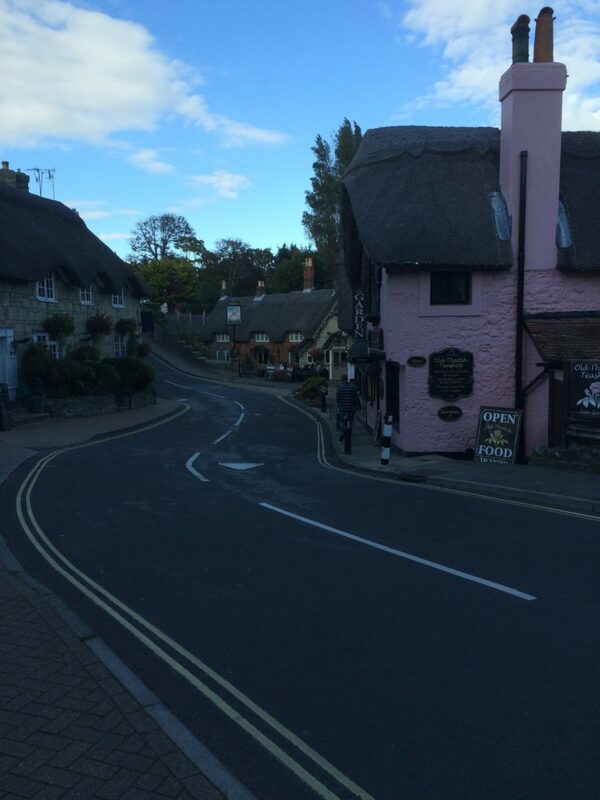 Heading back into Shanklin Old Village to complete the walk and you will see a lovely view of thatched cottages. As it was Sunday I decided to treat myself to a Sunday Dinner in Holliers Hotel, also located in the Old Village. They do a nice Sunday lunch in the form of a Carvery. I was hungry, so I piled heaps of food onto my plate. To begin with I thought I had been a bit greedy but I ate every last morsel, delicious! Next time I do this walk I’m going to go in the opposite direction. This means I have to walk up the very steep hill towards St Martin’s Down, but now I have experienced descending that hill I don’t want to do that again, walking up just seems so much safer. Although it is an effort to walk up I’ll just stop and take a breather at regular intervals. I didn’t really notice how long this walk took me but I would guess around 2 hours. I did stop a few times to take in the view and I wandered off the path a few times to get better views. I think if you are fit and determined this walk could be done in around an hour.